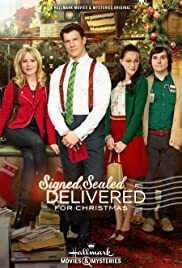 The POstables are on a mission to deliver a soldier's letter from Afghanistan to a teenager who's being relentlessly bullied, while Oliver's estranged father surprises him with news that shakes him to his core. A two-hour backdoor pilot of the TV series with the same name that focuses on four postal workers who take it upon themselves to track down intended recipients of undeliverable mail. It is rare to see a special-episode that is so carefully well crafted. The script had a lot to accomplish and it did so with excellence. Having followed the series, my household watched in amazement as newcomers in our audience picked up on and enjoyed as if they'd been following the show all along. The series core strength is its abundance sentiment, with nuances of miracles / belief in God. For the Christmas 2-hour episode they "took it up a notch" in both areas, yet were never heavy handed or preachy. Amazing. This series, perhaps better than any other on television, weaves fun and funny suspense that manages to draw the viewer in tugging on heart-strings along the way.